Magnetic Football Schedule + Your Custom Message = a Winning Combination! Football schedule magnets that include your personalized message are a promotional item that will be displayed prominently on the fridge of your clients. They are a useful promo that football fans will appreciate and refer to for months…and your message will be front and center every time they take a glance. 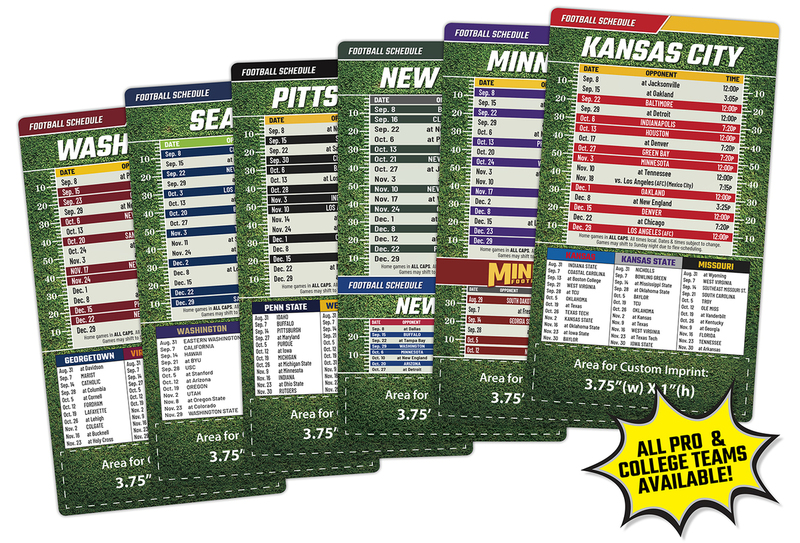 · 4×7 Football Schedule Magnet: Featuring team colors and an easy-to-read schedule, this quality magnet is the ideal size for the refrigerator of file cabinet. · Peel-and-Stick Pro Football Schedule: Attach your business card to your favorite team schedule. Your message is suddenly on the fridge for fans (and customers) to see every day. Monday night schedule is on the back. · Magnets — Football and helmet shapes available as well as smaller and larger rectangles. · Hand fans — Put your team’s schedule on a helmet-shaped fan. · Wallet cards — Fans like to have their team’s schedule handy. · Stickers — Place your team and message where they’re seen. · Laminated cards — 8.5×11 schedules are “keepers” with lot of space for messaging. · Banners — Show team pride in a big way. · Pro. College. High School…we can print any schedule along with your logo and message. · Promotional products — We have thousands of promotional items ready for your personalization…contact us with your needs and your personal sales consultant will provides quotes, samples, proofs, and order assistance. Make sure your football-loving customers connect your message to their favorite teams. This promotional opportunity to ensure longevity of your message only comes around once a year; have a winning season and order your football schedules, today.